I didn’t write today’s post. Mark Rountree sent it in as a guest-blogger because he felt so much passion about the topic. I wish I could claim it because it’s fabulous, I agree with every word, and it even has a Halloween theme! What more could you want?!? It’s Halloween season and I’m awash in nostalgic memories of long-ago evening tours of my hometown neighborhoods, costumed by my mom, pillowcase in hand and eager to capture the coveted candy bars (what, hard candy? Ugh). Hey, I wasn’t a perfect 9 year old, but I did know that ours was a small town back then, and I had better say Please and Thank You or my parents would hear about it. If you’re like me, all these years later, I sit with my bowl of candy and wonder if any of today’s 9 year olds will approach the door with even a semblance of courtesy. And while we’re at it, I don’t see good old-fashioned civility in a good many 19 year olds either. Not to get all Andy Rooney on you, but what’s with the social skills of kids who are The Social Networkers, and who in the heck thought ear-buds were a good invention? How in the heck are they going to hear me telling them to say Please and Thank You? It seems that many members of the youngest generation have permanently plugged into iPods, iPads & X-boxes, and lost their ability to relate sociably with living, animate objects. Like parents or professors. I’ve been involved with countless college annual fund campaigns—with my own alma mater, my past employers and my clients. In the last few years, I’ve witnessed an ominous escalation of dubious tactics to drive alumni giving rates, thanks in large part to the (thinly justified, undocumented) college “rankings” that have hypnotized college administrators (you can read recent rants about this in Getting Giving). It’s certainly true that young alumni giving rates can be boosted by urging pre-alumni (aka “seniors”) to give before they graduate. But annual fund staff are increasingly under the gun with declining revenues and and unsatisfactory US News rankings, so they understandably feel pressed to push student leaders to recruit their classmates for pledges. It’s time that the adults took charge of this situation. What’s got lost in all this commotion is the underlying responsibility to first and foremost create a culture of philanthropy among students. Every generation—but especially this generation–needs our help in learning how to listen, how to empathize, and how to act charitably toward each other and toward their world. No one who is bullied into a $20 gift has learned anything about charity. One of my favorite ‘thinkers’ in this area is Katherine Fulton, who noted in her last TED Talk that the primary Webster’s definition of ‘philanthropy’ ( “goodwill to fellowmen; active effort to promote human welfare…”) says nothing about money. This Halloween, I’m thinking hard about how, in college fundraising at least, we can use fewer tricks in order to treat our students to some real lessons in giving, not taking. Ashley & Associates, frequent reader of the Getting Giving Blog and an all-around good guy. OK, I’m not off the DCCC mailing list yet and THANK GOODNESS! 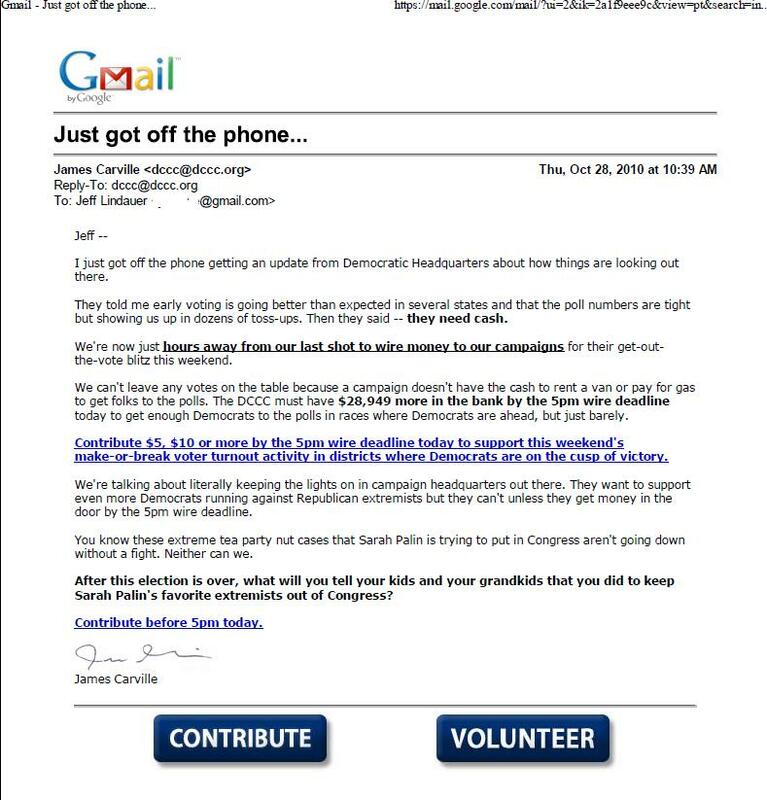 I would have missed this amazing e-solicitation from James Carville! Kudos to the person who writes this stuff. I rarely am both disgusted with and in love with the same person at the same time, and that’s how I feel about the copywriter of this one! And, if you can get beyond the political stuff and look closely, there’s quite a bit to be learned about the fine art of solicitation in this one. It pretty much covers every base. Who knew the Democratic party was in such a pickle? If you can’t get them $28,949 by 5:00 PM today, it seems like the power will be shut off at campaign headquarters! Oh, the humanity!! I assume that means the Democrats are out of business and “Sarah Palin’s favorite extremists” will take over the country! People will be shooting bears from airplanes in your backyard!!!!!!!!! I’m not commenting on the politics, really I’m not — I’m just amazed at the letter itself. Amazed. Frankly, the entertainment value alone might be worth a $5 contribution for me! I also like the ‘tea party nut cases’ line. Hysterical. Democrats, Republicans, Tea Party, as we near election day you’re all becoming nut cases!! And I enjoy watching from the sidelines. Bye Bye to Political Emails! I hope you’re sitting down, because I have a surprising fact for you: A bunch of money is being raised online these days. Yes, it’s true! And a big chunk of it is going to a wide variety of political parties and candidates for public office. Again, amazing stuff you probably didn’t know already. But of course you knew that. In fact, if you’re like me, you’ve probably been asked hundreds of times why you don’t raise a billion dollars online like candidate Obama did a few years ago. Thank goodness for the whole ‘texting for natural disasters’ thing – it gives folks something new to ask about! I’m all for doing what it takes to succeed, and with November’s election just around the corner it’s an important time for political fundraising. . . BUT IS 29 EMAILS IN SEPTEMBER REALLY NECESSARY!?!?!? Like so many others, I signed up early for both the Obama and Clinton campaign social media onslaughts. I won’t get into any political reasons for this, but at a professional level I wanted to learn more about how they were using social media, email and any other technologies to deliver their message and generate support. 29 emails in one month is just the tip of the iceberg. September was the first time I counted, and I bet there were other months with the same or even more. I get emails all the time, and it seems I’m really popular with the biggest names in the business! Nancy Pelosi seems to really like me, I get a bunch of stuff from her. 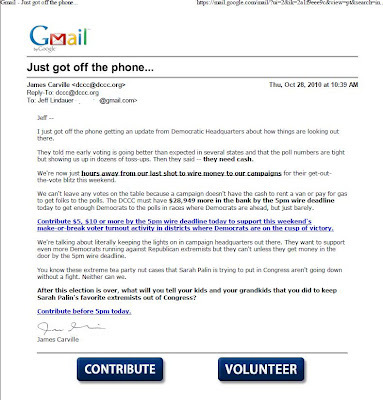 Jon Vogel, Executive Director of the DCCC must spend hours a day writing email! James Carville – a personal favorite, I just wish he’d come to dinner with me instead of sending email. I’d be entertained for hours. Even Bill Clinton and Al Gore wrote to say hi!!!! I am, by no means, a political junkie. I likely fall into a category that would be called ‘political cynic’ and I’d be hard pressed to name more than a handful of candidates or highly contested races that CNN covers every day. You’d think I could, given the volume of email I receive from just about every democrat you’ve ever heard of. What can I tell you from reading the emails? Basically, every republican is evil, they’re out to get you, and if we don’t buy more advertising or whatever else is needed they’ll take over congress and ultimately life will be awful. To be fair, I bet if I were receiving republican emails they say exactly the same thing about the democrats. People ask what the “right” number of letters/calls/emails is every month or year, and I always say there isn’t a magic number. It depends on many factors, and every nonprofit is different. Personally, I don’t think 29 is the number. It feels like WAY too many to me. Then again, I am not my donor. And I’m not theirs either! There are some pretty smart people working for these organizations and it must be working on some level. But for me, I finally felt overwhelmed and unsubscribed. I bet I’m not alone.